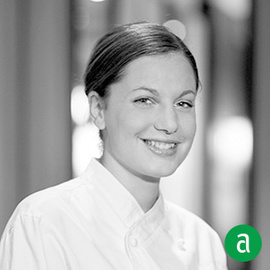 AJ Schaller, Executive Chef for Cuisine Solutions; CREA in New York shares her career timeline and advice for up-and-coming talent. I learned the hard way to wear comfortable clogs. I think about two specific pieces of advice given to me all of the time. One was from a friend that knew I was going to start my externship at Restaurant Daniel. He told me “Keep your head down, and all you will ever need to say is: ‘Yes Chef!’.” Another one was from Georgette Farkas, our former PR Director, when I first made the transition into the corporate team. Her motto was “Never explain and never complain,” meaning, don’t ever seem like you are making excuses, and complaining is just unproductive and basically just a bad look. Never doubt your capacity to handle something. It’s better to just dive in and just figure it out. The most important thing I learned at my first job is to clean as you go. For me, tough times are mainly tough just because of exhaustion. So I would have to say coffee has helped me through tough times! Doing my stage at Michel Bras in Aubrac, France was just magical. I learned so many techniques, how to forage, and also a real balanced and supportive way of working. Not to mention the countryside was breathtakingly beautiful. Daniel Boulud is a great mentor and generally just a great person to have on your side. He really opened so many doors for me and has given me many chances to excel and take on more responsibilities. My first chef when I was fourteen years old, Robert Remsburg, taught me all of the basics but also how to motivate on my own by timing my tasks. If it took 20 minutes to peel a case of carrots, I would try to do it in 15 the next time.